For a jungle theme baby shower, it's all about the decorations, snacks, and party favors. If you're the host of the baby shower, take inspiration from the ideas below. 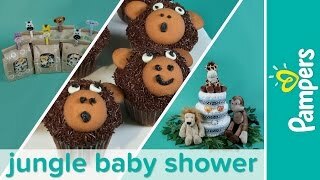 You can get even more help from Allison, who has a few tips on planning a great jungle safari themed baby shower. Place mini wafers on the top left and right side of the cupcake to make the ears. Stick the large wafer in place to make the mouth and nose. Press the white chocolate chips upside down into the cupcake to make the eyes. Put the black frosting into a reusable plastic bag. Twist it closed until the frosting is pressed into the corner. Then cut a small hole in the corner to make a homemade pastry bag. Use your pastry bag to draw the nose and mouth on the large wafer, and dot the eyes. For a lighter dessert alternative, consider a tropical fruit salad. Pineapples and bananas stay true to the jungle theme, and you can also create cocktails (or mocktails) with these fruits. Jungle Diaper Cake: For a show-stopping centerpiece, try a jungle-themed diaper cake. It's easy to make and will be useful for the mom-to-be. You'll just need a few basic craft supplies, some cuddly jungle-themed stuffed animals, and enough diapers to make up the three tiers of the cake. Have all your diapers and decorations handy? Good, now it’s time to make your jungle diaper cake. Of course, you'll need more than a centerpiece to set the tone. Decorate the space with plants and flowers for a true jungle feeling. Green and brown balloons are a nice touch. Place some stuffed animals, like monkeys and lions, around the venue. They’re not only great decorations, but also they'll be great company for the new baby in the nursery. As the host of the baby shower, you might want to thank your guests for coming by giving each guest a small gift as they leave at the end of the event. Cut the animal face shapes out of the felt using the template, and use your hot glue gun to assemble the pieces of the head. Add googly eyes. Paint the clothespins a matching color, and set them aside to dry. Use the hot glue gun to stick each face to the top of a clothespin. Cut a magnetic strip to fit the back of each clothespin, and stick one side of a strip to each clothespin. Now, with your jungle animals all ready for their party debut, you can get to work on your goodie bags. Decorate brown paper lunch bags with jungle-inspired stamps, and then fill the bags with your favorite trail mix or sweet treat. Close the top of each bag with one of the animal clips. Your guests can use these clips in their own pantries or as a fridge magnet as a reminder of your memorable shower! Looking for animal-themed baby shower games? We've got you covered with our baby shower game ideas. See if your guests can name baby jungle animals in a fast-paced memory game. Need more creative baby shower options? Check out our unique baby shower themes tool for everything you need to make your chosen theme come to life, such as decoration tips, menu ideas, and party games inspiration.